Sophomore Esha Khator first started participating in Poetry Out Loud last year, using it as an outlet to express her passion for poetry's complexities. To match my dark mood. I have left all the sugar out of the pie. The audience falls dead silent as Esha Khator, a freshman at the time, begins to recite lines from Suzanne Buffam’s “Enough” while gazing out toward the panel of Poetry Out Loud judges in front of her. Throughout the year, she will progress from the class round, hosted by her English teacher, Stephanie Glotfelty, to the school round, where she will compete with Jefferson’s top contestants from each grade. 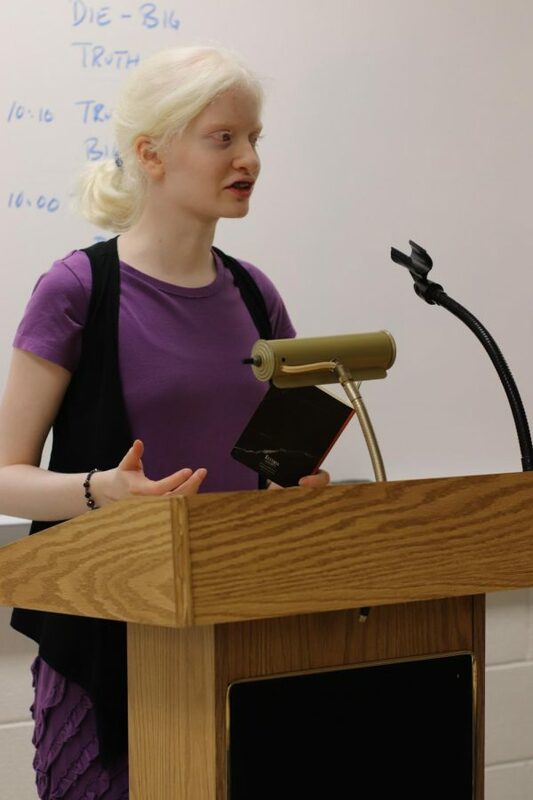 In fact, even a year later, as she prepares for her second time in the competition, Khator will still remember the poem as a stunningly poignant work of art, one that, among many others in the past, has continued to drive her passion for poetry. Khator, now a sophomore, first began exploring her poetic nature at an early age, opting for the nuances of poetic language to rather than the direct conciseness of cut-and-dry papers. With myriad literary devices weaved into the stanzas of a poem, she found that creating such masterpieces allowed her to portray even the simplest of ideas in a more elegant and sophisticated manner. Oftentimes, Khator looks for poetic works that narrate a complex story, like ballads, or intensely emotional pieces that she can understand and empathize with. She believes that in doing so, she will be able to convey the same message and feelings as the author intended to do through the poem. To accomplish this successfully though, Khator puts in a considerable amount of effort towards perfecting her performance and recitation techniques. The budding poet also heavily uses visualization to facilitate her presentation of the poem’s meaning and act as another prevention measure against the possibility of freezing up in front of an audience. “Getting started itself is kind of difficult because like you’re still seeing people in front of you, but as soon as you get into the poem, you can pretend to be the author or pretend to be someone else reciting the poem and then you’ll finish it [before you even know it’s over],” Khator said. In addition to Poetry Out Loud, Khator plans to continue furthering her devotion towards poetry by going above and beyond and trying to apply the art to other activities. She believes that those who are brave enough to take the plunge into the world of poetry will receive valuable benefits in return.